The scene is magical in our large shopping malls. Lights of gold and colourful baubles decorate tall trees. Joyful Christmas songs fill the air. I hear a happy lift in people's chatter. 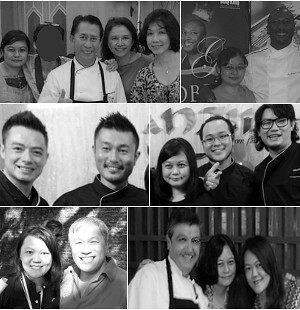 Wide smiles grace glowing faces. Well, my kitchen feels magical too. At this time of year, I attempt to bake festive treats and it will have nothing to do with chocolate chip cookies! Chocolate chip cookies are what I call 'staple food' in the sweet treats department. Therefore, a festive cookie needs to be something else. I try to be different about it, of course. 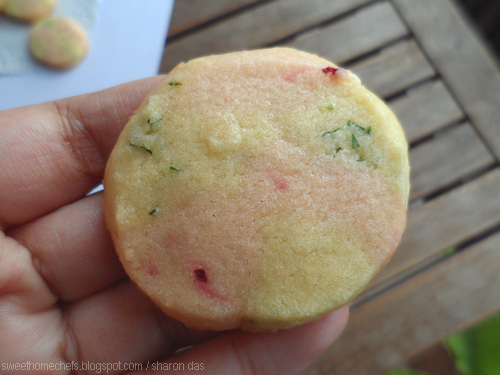 That's how beetroot and parsley made its way into this cookie. The other reason was because I had parsley growing in my garden and I felt that it needed to go somewhere. Haha, I know. The end result of these adventures, although often pleasing, is no reflection of work in between, which is sometimes laden with dramatic moments of 'why-is-this-happening-to-me'. As I rolled this cookie dough into shape, I consoled myself with an, "It's going to be alright, Hun. You've got this! " This cookie dough is soft and a little sticky. It requires refrigeration for easy handling. As the weather was humid, I had to work quickly and was constantly on my feet, putting the dough in and out of the refrigerator, because I was baking in batches. It's a recipe I adapted from The Australian Women's Weekly Cookies book, which was originally for choc and cranberry checkerboards. I did away with four of the ingredients and a couple of steps, then added what I thought should be in there. Anyway, off one went into the oven. A test. It turned out really great. So, I proceeded to bake the entire batch. 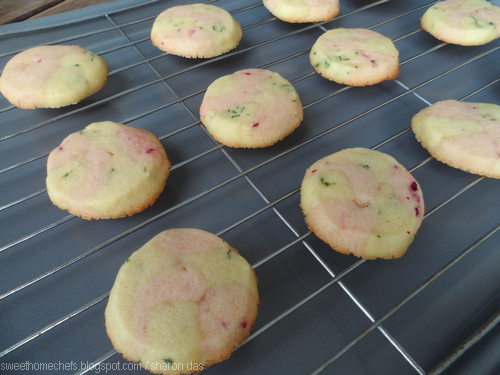 Beetroot and Parsley Cookies Fresh Out Of The Oven! 1) Using an electric mixer, beat all these ingredients together - butter, sugar, vanilla and egg, until light and fluffy. 2) Stir half the flour in. Keep stirring until all of it has been incorporated into the batter. Then, stir the other half in. 3) Divide the dough into half. 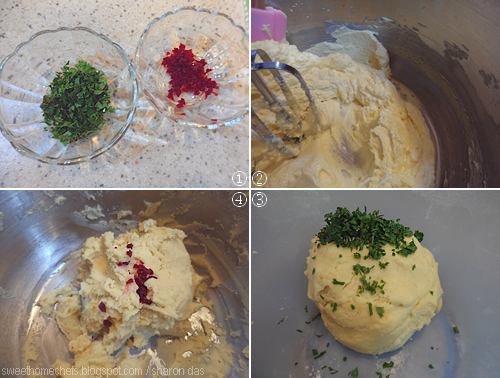 Add parsley into one, and beetroot into the other. Knead until it is evenly spread. 4) Transfer this onto baking paper. Fold the baking paper up and shape the dough into a long bar. Then, refrigerate covered in the same baking paper until it's easy to slice - about 45 minutes for me. 5) Work quickly, slice the chilled bar lengthways. I did this on a cutting board lined with baking paper. Clean the knife after every slice. This is NOT the fun part. The dough was a little sticky so I shaped it using the baking paper it was already in. Do the checkerboard design - Slice 6 thin strips from each bar. Stack 3 from each together in alternate layers to make a bar. Then, give the whole 'thing' a little twist and gently press and roll to combine, making it into a round bar (like in the pictures). Do the same for the the remainder of the strips...or do something else. Then, wrap it up again and chill until it's easy to manage again. 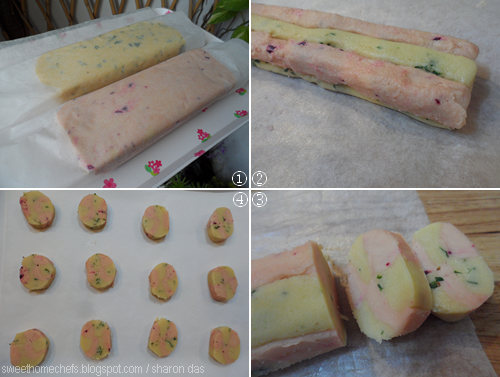 Now you will have two round bars of pretty pink and green dough in a distorted checkerboard design. 6) Line the tray with baking paper. Take one of the now combined dough out of the fridge. 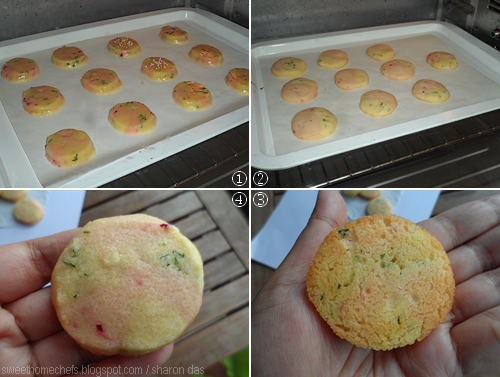 Cut into just under 1 cm slices and arrange on the tray for baking. The cookie will spread a little, so give it some space. 7) Bake in a pre-heated oven at 170C for about 10 minutes (or until the edges brown a little). Let it stand on the baking tray for about 5 minutes before transferring onto wire racks to cool. This temp and timing suits my oven best. Always do the bake test! Continue doing 6) and 7) until all the dough is finished. 1) Take the chilled dough out. 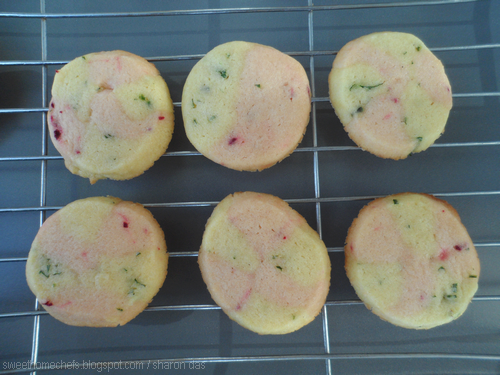 2) Slice lengthways and arrange in alternate flavours. 3) Chill again, then slice. 4) Place on baking paper and bake! 1) The cookie begins to spread in the oven. 2) The edges are brown, it's done! 3) The back of my cookie. 4) The pretty pastel front! Texture-wise, this is neither crunchy nor soft, something in-between. It smells like vanilla - devoid of parsley scent. This is sweet but not overly. I packed 10 pieces for my guy to bring to the office. He came home empty handed with an uh-oh for eating too much. Yep, he rated this as one of the best cookies I've ever made. I had to laugh. I guess all the work was worth it after all! 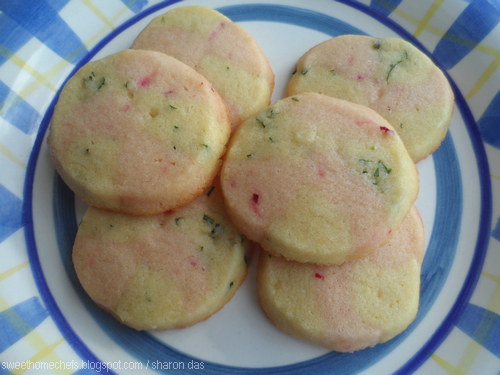 Biting into a Beetroot and Parsley Cookie! 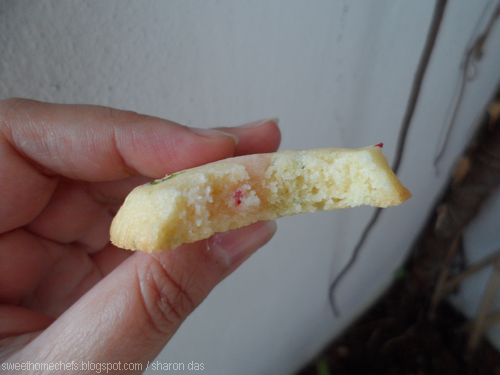 These butter cookies are so original and delicious! This is awesome! I never tasted beetroot and parsley in pastry before. An interesting recipe, Sharon. I'd never have thought about parsley going into cookies. But your cookies look so good and the beetroot does its job too. Love the way you rolled up the two kinds of dough. Very creative! Oh wow! At first glance, I thought those were fish cakes! Love this interesting twist, Sharon! I see hints of Christmasy colours in these cookies. Very pretty!